Pinner was recorded as Pinnora in 1232 and the name is derived from a personal name (or nickname) Pin (or Pinna), and the Old English ora, 'bank edge' or 'Slope' - this refers to the original village street which slopes steeply up to the church from the Pinn River - and thus means 'the slope to Pinna's place'. It is certain that the River Pinn takes its name from the old village and not vice versa. It was recorded as Pynnor in 1483. The station was opened as PINNER on 25 May 1885. 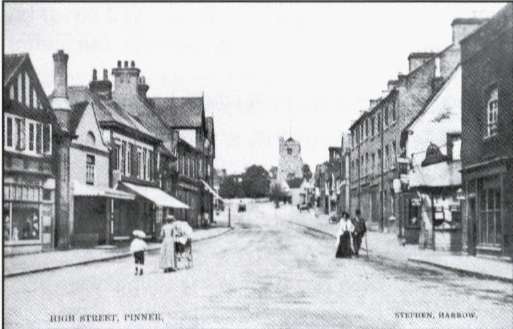 Pinner High Street about 100 years ago. Little has changed to its general appearance since this picture was taken.